This state park is on the eastern coast of Kauai, off the Kuhio Highway and near Wailua. This is Hawaii’s most visited state park, drawing nearly 1 million tourists to Kauai annually. The park covers 109 acres and is free to the public every day during sunlight hours. The park is near Mount Waialeale, “the wettest place on earth.” You can find it in the valley of Hawaii’s only navigable river. The terrain features forests, rivers and waterfalls. There is also the famous Fern Grotto area and many ancient Hawaiian places of worship and refuge. Kauai has the most rivers in Hawaii. This helps to attract many water-sports enthusiasts to the island. Kayaking is a popular activity for those wanting to paddle over rivers and calm ocean waters. Another favorite water sport on the river is water skiing. However, if you just want to kick-back and relax, you can simply take a riverboat cruise. Many riverboat tours offer Hawaiian music and storytelling that enhance visitors’ experience as they ride down the river. Travelers can also enjoy walking through trails to the surreal beauty of the Fern Grotto. Many couples choose to marry or renew their vows in this incomparable location. Other walks include hiking to the majestic 113-foot waterfall Wailua Falls and stunning ‘Opaeka’a Falls. Waimea Canyon is on the southwestern side of Kauai. The state park extends over 1,866 acres, ending where Koke’e State Park begins. The terrain of Waimea State park varies. But people know it for the vibrant red colored hills in the canyon. Mark Twain described it as the “Grand Canyon of the Pacific.” It stretches for 14 miles, is one mile wide and over 3,600 feet deep. The Waimea River created the canyon water with heavy rainfall from Mount Wai’ale’ale, one of the wettest places on earth. The park’s hiking trails offer some of the most breathtaking views of Hawaii. The Iliau Nature Loop is less than a mile long. It features views of Waimea Canyon and numerous native plants. The Kukui Trail is a longer stretch of nearly 3 miles. It’s a more challenging trek and descends 2,000 feet to the canyon floor. Locals have used tubing gear to float down the Waimea River to Waimea rather than hiking back up. Vacationers can purchase a permit and stay at one of the campsites nearby the park. There are also permits for boar and seasonal goat hunting as well. There is no entrance fee and the park stays open daily during daily light hours. Wet Cave at Ha’ena Beach Park. Ha’ena State Park is on the northern shore of Kauai and begins where Kuhio Highway ends. From hiking trails to sea caves and historic sites, this park holds many of Kauai’s best secrets. The park spans across 230 acres and is open free of charge on a daily basis during sunlight hours. Perhaps the most notable features are the wet sea caves, nearly 4,000 years old. On the eastern side of the park stands Ha’ena Beach. On the western side, a reef protects Ke’e Beach. Thick forests surrounds the area full of guava, coconut and ironwood trees. There’s also a heiau or temple nearby. The park provides views of the famous Na Pali Coast as well as of Kalalau Valley. Here, there are steep hiking trails and waterfalls that await eager travelers. Ha’ena State Park has ample swimming, hiking, exploring and camping for the adventurous traveler. At Ke’e Beach, families can fish, dive or swim over its vibrant reef in the summertime months. However, winter brings intense swells making this place an extremely hazardous place to swim. The state park should not be confused with nearby Ha’ena Beach Park. But, it’s also a great place for water sports when the waves are calm. Minutes away is Kaulu Paoa Heiau where ancient Hawaiians would worship and offer sacrifices. The park’s famous Waikanaloa and Waikapalae wet caves’ water levels vary, depending on the tide. 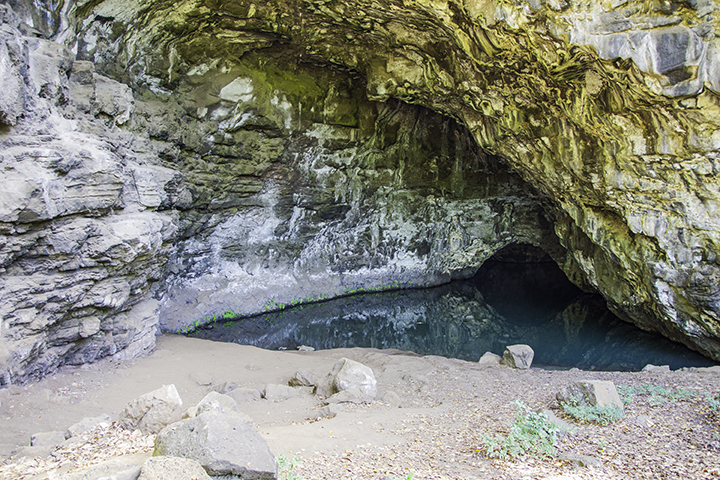 You should explore these caves while the sun is north of Ha’ena. This light creates the glowing blue water from the caves. The Maniniholo dry cave is an easily accessible area for families, as its wide entrance entices explorers. Hikers will enjoy the 11-mile Kalalau Trail, which starts on a rocky and steep path. 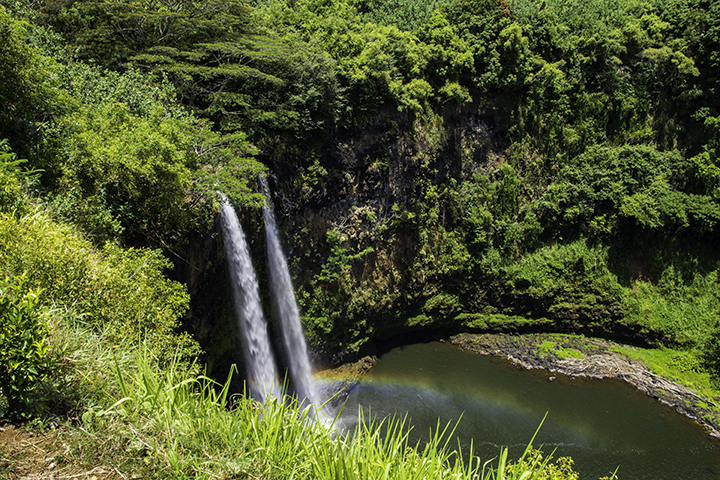 The challenging trail wanders through the Na Pali Coast and features the 300-foot Hanakapi’ai Falls. People wishing to camp must obtain permits for Hanakoa Valley and Kalalau Valley or if they pass Hanahkapi’ai Beach. The Kalalau Hiking Trail ends at stunning Kalalau Beach. The Ha’ena State Park offers restrooms, showers and drinking water. Koke’e State Park is an expansive region reaching over 4,345 acres of mountains and forests. The park is located roughly 15 miles north of Kekaha on Koke’e Road. 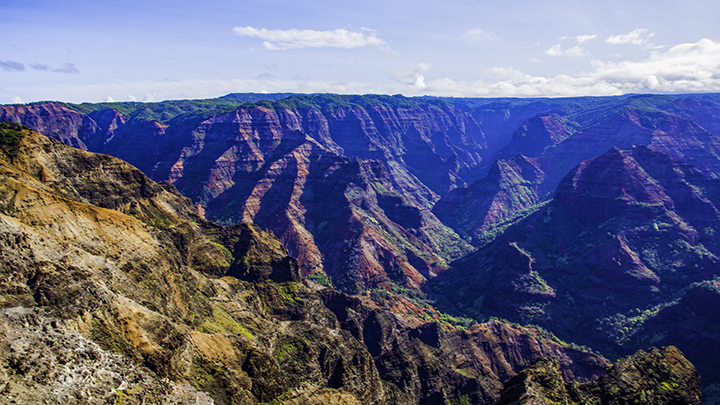 It covers part of Waimea Canyon and shares a border with Waimea Canyon State Park. The park has free entry and is open during daylight hours every day of the year. Koke’e State Park features native plants, hiking trails and mountain ridges with breathtaking views. The park has many hiking trails that allow one to venture through a wide range of landscapes. The damp forests trails are full of plants like hibiscus, redwoods and koa trees. Here, you can even see native Hawaiian birds and the occasional wild goat. The state park is between 3,200 to 4,200 feet above sea level and has trails over mountain ridges and cliffs. Due to the park’s expanse, there are countless opportunities for hiking and camping. Hidden trails, native flora and ocean views make this one of Kauai’s most interesting state parks. The Koke’e Natural History Museum offers detailed information about the park and nearby Waimea Canyon. 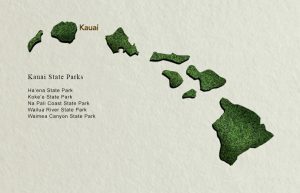 Travelers can find 45 miles of trails in Koke’e State Park. There are 12 rental cabins at the Lodge at Koke’e. Another camp site is the Kanaloahuluhulu Meadow. Here, visitors can grill their food and take showers. Koke’e State Park’s high elevation makes for chilly days, even in the summer. With 70 inches of rain annually and temperatures from 45 to 68 degrees, a light jacket will be a necessity. Families may also enjoy guided hikes. Here, visitors can witness panoramic views of the valley and coast at the Pu’u Hinahina and the Kalalau lookouts. People can try their hand at wild boar hunting or trout fishing. While many may even find plum picking season fun. There are picnicking areas, showers, camping areas, drinking water and a restaurant within the park. 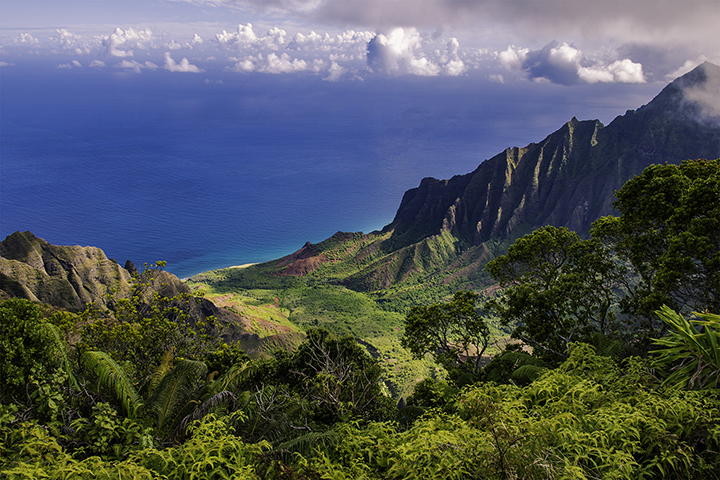 One of Kauai’s largest parks, the Na Pali Coast State Park stretches over 6,175 acres of land. It begins at Ke’e Beach and continues through Polihale State Park. The park is not accessible by vehicles. You can only enter it on foot by hiking, from the ocean by boat or from the air by helicopter. The park is open daily during sunlight hours and there is no entrance fee. Na Pali means “high cliffs.” Many know it for its verdant sea cliffs that soar up to 4,000 feet above the ocean. Here, there are deep forests, waterfalls and sites where ancient Hawaiians would live and farm. Because of its proximity to the mountain, visitors should be wary of falling rocks, cliff edges and flash floods. The Na Pali Coast is one of the most striking landscapes in Hawaii. Therefore, it is no surprise that camping, hiking and water sports are some of the area’s most popular activities. Venturing out on the park’s hiking trails is a favorite activity. This is because you can only see the park close-up on foot. The Kalalau Trail starts in Ke’e Beach and continues for 11 miles through five valleys and several beaches. Day hikers must also obtain a permit if proceeding beyond Hanakoa Valley. For those who want to explore the from the ocean, there are boat and kayaking tours available. Kayakers should be aware there are only two legal kayaking landing areas in the park. One is Kalalau Valley if you have a permit. The other is Miloli’i Valley. Some kayaking tours offer journeys along the entirety of the state park with a lunch break on Miloli’i Beach. During the summer months, you won’t need a permit to land at Miloli’i. However, camping does require a permit, year round. There are several camping options at Na Pali Coast State Park. Visitors may camp at Hanakoa or Kalalau. Permits cost $20 per person each night for non-residents. Be sure to purchase your permits early as they tend to book quickly in the summer months. Polihale State Park is on the western shore of Kauai, just below the Na Pali Coast State Park. It begins at the end of a 5 mile unpaved road near Mana Village and Kaumuali’i Highway. The park covers 140 acres of land, most of which is sandy and coastal. Polihale is open to the public every day during day light hours, without an entrance charge. During rainy periods, the dirt road to Polihale State Park may become muddy and dangerous. There are also sand dunes and heavily sanded areas. These might require a 4-wheel drive vehicle. The park at the end of the Mana Plain has desert cacti and sometimes 100-foot tall sand dunes. At the end of the road, travelers will see expansive and uninhibited views of the coastline. Polihale State Park is home to Hawaii’s largest beach. It stretches for 15 miles and is usually 300 feet wide during the summer months. The beach at Polihale State Park has treacherous shores with extremely dangerous rip currents. While one should not swim here, it’s a great place for sightseeing and to witness vibrant sunsets. The only safe swimming area, assuming big waves are not breaking over it, is a shallow sand-bottom pool called Queen’s Pond. 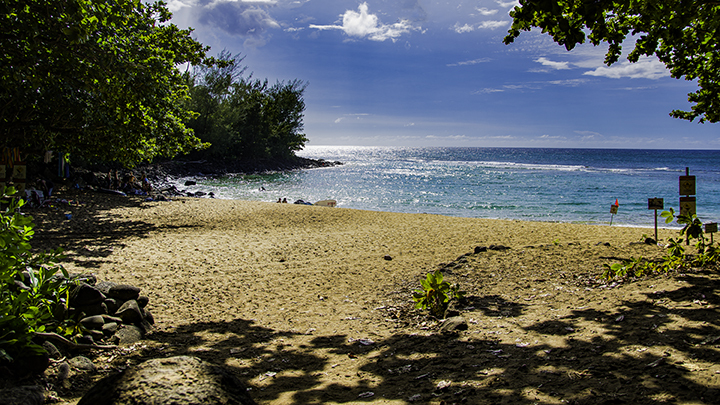 Below Queen’s Pond, tourists will find the partially restricted Barking Sands Beach. The sand at this beach makes a barking noise when a person walks over or slaps it. Because of its unsafe waters, people come here just to picnic and soak in views of Niihau. You can even camp on Polihale Beach. The park provides basic facilities for those camping with a permit. The park has picnic tables, shelters, showers, drinking water and restrooms.